Urban transformation is vital to global sustainable development as humans increasingly come to dwell in cities. Within cities, the mobility sector promises the highest potential of carbon emission reduction. The disruptive business innovation brought about by the advent of app-based smart-sharing systems is emancipating collaborative consumption of mobility at larger and deeper scales, ranging from car-pooling, expanded electric vehicle (EV) use to bike-sharing. 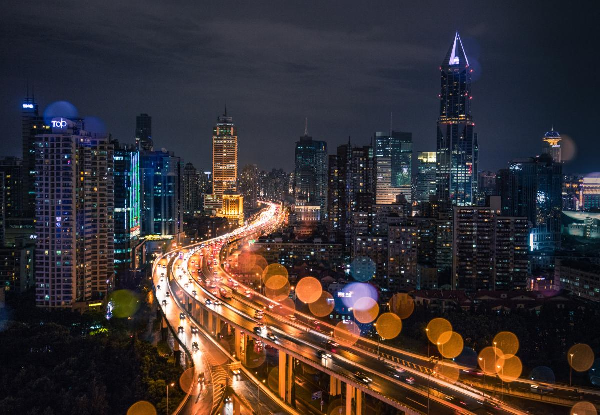 Synchronizing the existing yet under-realized low-carbon transport modes in cities, such as public transport, with emerging and diversifying app-based sharing mobility business models, offers huge potential to transform urban mobility toward sustainability. Yet, the rapid business expansion and innovation of the sharing mobility companies have profoundly challenged existing socio-economic relationships, knowledge systems and physical infrastructures in cities. This study explores the synergy between the social-ecological innovation in the sharing economy and the sustainable development of urban systems, using empirical data from three business cases in the emerging sharing mobility sector – in modes of ride-sharing, EV-sharing and bike-sharing – of Shanghai, China. It indicates that there is a strong co-evolution mechanism between the transformation towards more sustainable city at the macro-level and the business ecosystem innovation towards greener and smarter transport at the meso-level. 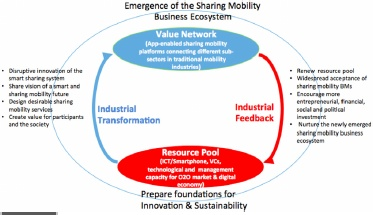 We argue that the two level transformations, triggered by the disruptive innovation of the sharing economy and led by urban transformation towards sustainability, mutually influence each other and re-enforce sustainable values and practices in the fast changing urban context and business innovations in Shanghai.